This home healthcare assistant job description covers the basic responsibilities and duties of employees who are pursuing careers in nursing, hospice and healthcare. Providing prompt and professional services to clients, in their own homes. Helping clients with regular chores, everyday hygienic duties, and more. Being the liaison between the client and the "outside world." Transporting client to appointments when necessary. Maintaining a friendly, professional attitude at all times. Willingness to assist in all manner of activities. Must possess a driver's license with a clean record. 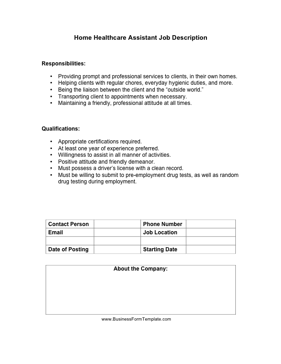 Must be willing to submit to pre-employment drug tests, as well as random drug testing during employment.